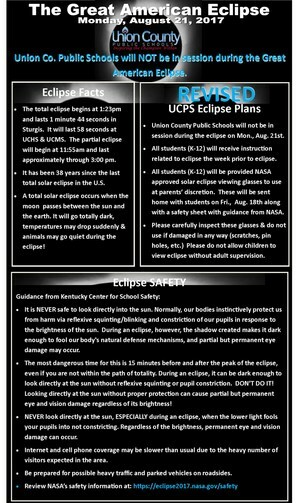 In light of increased traffic anticipated in Union County, a great deal of parent concern about the safety hazards of viewing the eclipse, and strongly worded guidance received by our Board attorney, it is the best decision for our students to close on this day so that parents can decide how best to safely view the eclipse at home with their children. 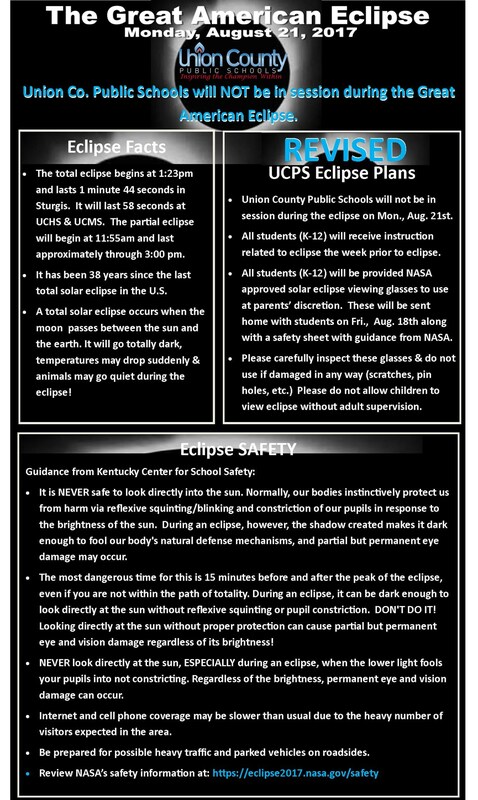 After careful consideration, Union County Public Schools will NOT be in session on Monday, August 21st during the total solar eclipse event. We will be sending home a pair of NASA approved solar eclipse viewing glasses with each student along with a NASA safety guidance document on Friday, August 18th. These glasses are to be used at parents’ discretion and we caution you to please inspect these glasses closely and do not use if they are scratched, damaged, or have any punctures even the size of a pinhole. We encourage every parent to thoroughly educate themselves on safety information regarding the eclipse and communicate their family’s eclipse viewing plan and safety precautions with their children. Below is a REVISED flyer communicating our REVISED plans for the Great American Eclipse. Please take time to familiarize yourself with NASA’s safety recommendations and if you choose to view the eclipse, exercise caution.